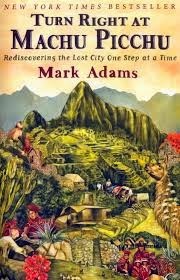 a book chick: "Turn Right at Machu Picchu"
"Turn Right at Machu Picchu"
my take: This is a rather detailed exploration into the who, what, where, when, and why of Machu Picchu. Hubby, daughter, mother and I travelled there several years ago so the title caught my eye. This is a must read if you are planning a trip there and will help you savor the memories of being there if you've already been. Geography and/or history nerds will enjoy as well. The author is a funny, dorky, and interesting narrator and brings in some some colorful real life characters.